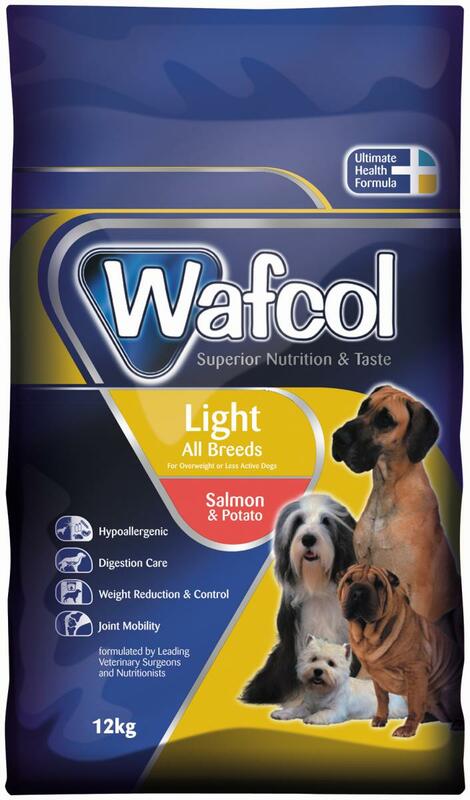 Wafcol Super Premium Light Salmon & Potato is a specially formulated dry food which meets the nutritional needs off less active or overweight dogs. This hypoallergenic recipe has a 40% less fat content than adult diets and is formulated with no cereals such as wheat and wheat gluten, maize, barley, rye and oats. Also excludes red meat, poultry, white fish, dairy products, soya and artificial colours, flavours and preservatives - known allergens that may trigger food allergies or intolerances. Vitamins (kg):Vitamin A (as retinyl acetate) 14,867 iu, Vitamin D3 (as cholecalciferol) 1000 iu, Vitamin E (as alpha tocopherol acetate) 111 iu. Trace Elements (kg): Ferrous Sulphate Monohydrate 297.6 mg, Ferrous Chelate of Amino Acids Hydrate 19.8 mg, Calcium Iodate Anhydrous 1.5 mg, Cupric Sulphate Pentahydrate 39.1 mg, Cupric Chelate of Amino Acids Hydrate 48.9 mg, Manganous Sulphate Monohydrate 108.3 mg, Zinc Sulphate Monohydrate 274.5 mg, Zinc Chelate of Amino Acids Hydrate 329.4 mg, Sodium Selenite 0.5 mg. 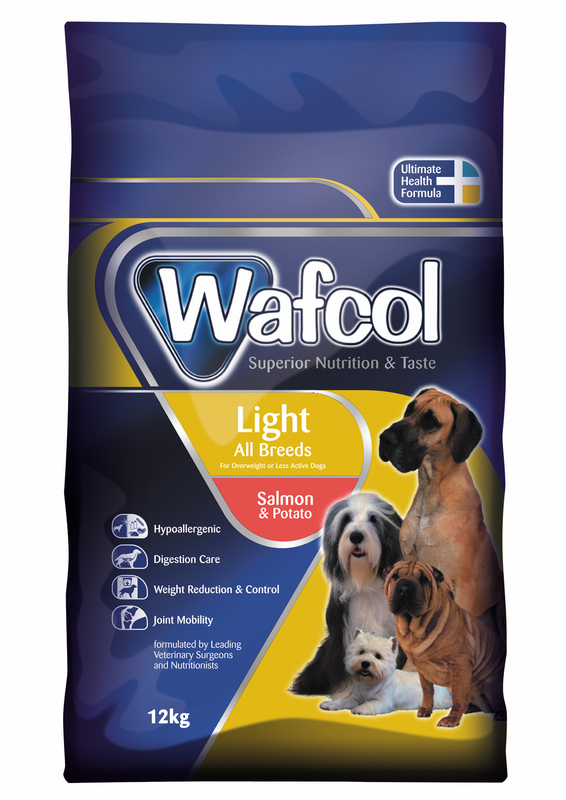 There are currently no questions for Wafcol Super Premium Light Salmon & Potato Dog Food - be the first to ask one!